Richard Diaz-Granados is a typographer and graphic designer. His early exposure to graffiti fueled his passion for creating unique letter forms. 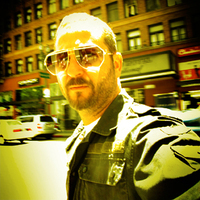 In New York, 2001 he started his own type foundry called Stereo Type Haus creating custom fonts for clients as well as commercially available designs. In 2009 he launched Typarchive.com, an image database focused on hand painted lettering as well as dimensional and neon. His inspiration comes from album cover art, hand painted vernacular and lowbrow pop culture. Other interests are music and photography. In 2005 he started Inner Current, a record label focused on instrumental beat music. He is currently working on a street photography series in Downtown Los Angeles where he resides.